The Thompson family settled in the Santa Cruz Mountains near the top of Black Road, in the 1880’s. A family with ten children, school became an important issue. So, the Thompson’s donated land and the community came together to build a school for all of the local children to attend in 1881. Built overlooking Howell’s Lagoon, it became known as Lakeside School. 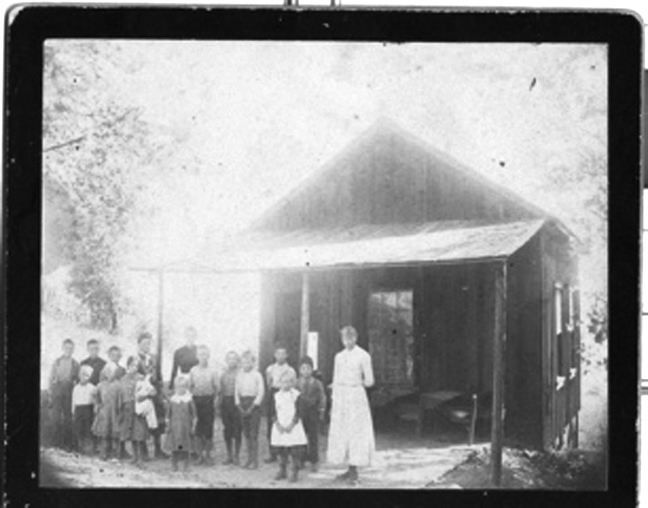 There is evidence of an earlier school started in the wine cellar of a family on Gist Road, but Lakeside School was the first official documented school in this area of the Los Gatos- Santa Cruz Mountains. The school year opened with only eight students, but by the end of the first year the attendance had grown to 11. The school’s continuing growth necessitated a larger school, so in the 1890’s, a larger building was constructed on the same site, again by the families of the students. Fred Reif was paid $20 for about one sixth of an acre of land adjacent to the school with a spring on it. The children carried water to the classroom by bucket. The water bucket had a dipper in it so that all of the children could share the water. The school became a community focal point. The dances that often were held there became so popular that a large platform was built near the school on more land donated by the Thompson family. Eventually, the platform was enclosed for all weather use and named, Lakeside Hall. It contained a stage, dressing rooms, counter for refreshments, and a most unusual square grand piano. Occasionally, professional musicians were hired, but generally the musical entertainment was provided by local people who played fiddle, harmonica, or piano. Officially, the school offered eight grades of education, with the students ranging in age from five to 16. However, since the daily buggy trip took an hour down the mountain and about two hours back up--on a good day-- and required paying a toll, it was too difficult for some older students to go to Los Gatos to attend the high school there. Those children without the means to go to Los Gatos High School stayed at Lakeside School and learned while helping the younger students. Other older students attended the high school by staying in town with family or friends during the week and coming home on weekends. The only route to town was one originally used by the Ohlone Indians, then by the padres on their travels between missions. John C. Fremont traversed these mountains during his scouting party of February, 1846. Shortly thereafter, the road was improved and was given the name of “Jones Road” after Zachariah Jones, known as Buffalo Jones because of his resemblance to one. The road was steep and rough. In the summertime, the dust could be horrendous. The bull teams and stagecoaches dug a pair of parallel ruts that made the journey perilous for travelers and often impassable in winter. In 1854, at the request of the Santa Clara County Board of Supervisors, two exploratory parties were sent out to evaluate conditions, and the possibility of creating new roads. One party traveled east from San Jose to the San Joaquin area, and the other south traversing the Santa Cruz Mountains to the coast. The Santa Clara County Sheriff John Murphy, a great horseman, was sent over the Santa Cruz Range. His party followed Jones’ Road as well as Mt. Charley’s Road, and then estimated that it would cost $10,000 to build a road from the Toll House (the original toll house has been remodeled and is today a commercial building on the corner of South Santa Cruz Avenue and Wood Road, next to the Toll House Hotel) to the county line (the county line follows parts of Summit Road, with a detour down Old Summit Road and up Loma Prieta Avenue, which becomes Loma Prieta Way). To achieve a road with a gentle grade, it was carved out of the west side of the Los Gatos Creek canyon where it joined the original road of 1791, which Jones already had improved. From that point on, a new road had to be built to the summit of the mountain. the teamsters tore down the gate at the Toll House in Los Gatos. The Santa Cruz Gap Joint Stock Company was reluctant to allow the road to become public, because in its twenty years in existence, the toll had brought in $137,127.91. Moody Gulch is named after the company’s secretary, D.B. Moody, and the toll collector, James Kennedy, has a road in Los Gatos named after him as well. Black Road wasn’t any better, so the school year consisted of several months during the summer with a long break in the winter when the weather deemed the roads too poor for general travel. Even in good weather, the children attended school only when they weren’t needed in the fields. The major industries on the mountain were sawmilling the beautiful redwoods for lumber, stakes, and shingles; and farming. Vineyards also dotted the hills and provided the most prolific crop--wine grapes. Orchards of prunes, pears, and apples were abundant, as well. To the east of Lakeside School on the main route over the mountains, the towns of Lexington and Alma were bustling communities. In fact, Forbes Mill, later to become the Town of Los Gatos, was at that time a mere wagon stop on the road to the town of Lexington. By the turn of the century, most of the Thompson’s had graduated from Lakeside School and the center of the population density had shifted down the hill onto Black Road. So the district purchased a two acre parcel from a Mr. Baker for the sum of $200. 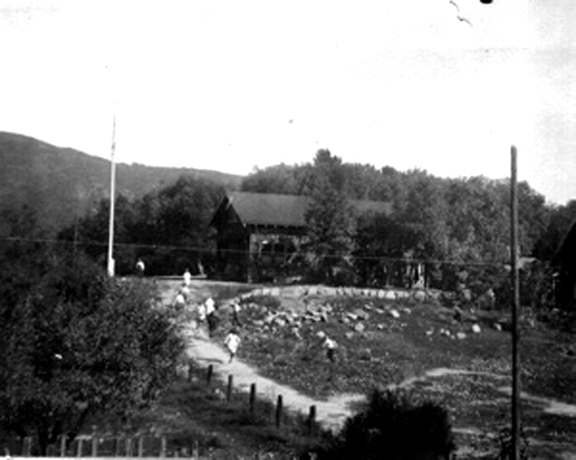 In 1904, the Lakeside School building was sawn in half, dragged down the hill by a team of oxen, and set up on the knoll where the little red school house is today. The school survived the earthquake of 1906 with only minor damage. School was closed for two weeks while a sagging ceiling was repaired and the community recovered and cleaned up after the disaster. Water was always an issue at Lakeside School. At first, students carried water from a spring on the Raymond property down the road to the school. The Raymond’s owned a popular mountain retreat, aptly named the Raymond Lodge. Attempts were made several times to dig a well on the property but to no avail. Around 1914, a successful well was dug by the maple trees, but unfortunately it was located below the septic tank and the water was contaminated. In 1917, the building was considered too dilapidated to serve as a school anymore and it was once again moved, this time it was dragged back about forty feet where it was used as a residence for the teacher. A new building was constructed-- the little red school house that still stands on the property to this day. Indoor plumbing was built into the new school by the generosity of John and Jennie (Thompson) Stewart. The district had run out of money, so the Stewart’s bought a spring near the foot of Thompson Road, had a tunnel drilled into the hillside, and fitted it with a tank and pipes to the school. They sold the whole water setup to the district in 1918 for $613.00, but payment was deferred until such time that the district could afford to reimburse them. The old school building continued to deteriorate. After being used as a resid- ence for the teacher in the ‘20, it became a gymnasium in the ‘30. In the ‘40, however, it lost its roof and became off limits to the students. By the ‘50, the building had lost half of its walls and had exposed chicken wire in their place. So in the early ‘60 it was deemed a hazard and removed. 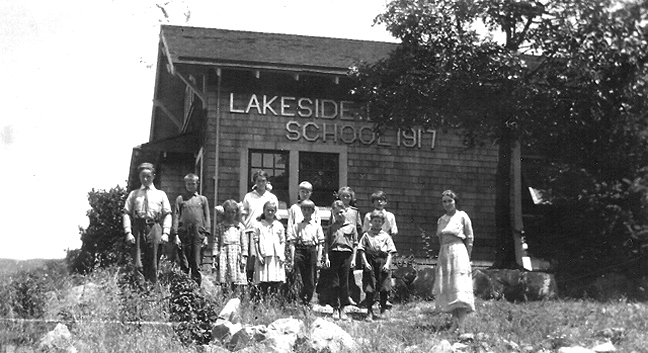 Lakeside School went through a rough time in the ‘30 and ‘40 not having enough students to warrant their own teacher. Times were tough with the depression and World War II, the trains had been discontinued through the mountain and a new highway was being planned to accommodate the rise in popularity of the automobile. They borrowed pupils from other districts to achieve minimum enrollment, or they hired a teacher who brought several children with her. But by the late forties, with the completion of Highway 17, the population of the mountains began growing again. What used to be an arduous trip to town could be made in a reasonable amount of time. It was even acceptable to travel to town daily for work, so the mountain’s demographics transformed from residents with summer cabins and cottages to year-round dwellings for those strong-willed individuals who wanted to live in the mountains. The population of Lakeside School grew as well, and a second teacher was hired for the 1954-55 school year. The following year, the classroom was divided with a partition, and in 1958, a portable classroom was installed in front of the school. A third teacher was added with the new building and in 1964 another portable was squeezed between the two buildings, and another teacher hired. Each teacher taught two grades. The portables occupied much of the former play area. By 1965, Lakeside School had seriously outgrown its buildings, so the district purchased a portion of the Criswell’s adjacent prune orchard. The district boundaries were redrawn to include the former districts of Brown School and Central School. The new school was first rate, featuring four classrooms, a library, an office, a large play area for the kids to spread out on the lawn, and was dedicated in April of 1967. The student population quickly swelled to 180 and two double portable classrooms were leased, and eventually purchased by the district. A kindergarten was added in 1983, giving the district nine grades of students. By the 1987-88 school year, the population increase made it impossible for Lakeside School to accommodate so many grades. Thus, the decision was made to move the 7th and 8th graders down the mountain to Fisher Middle School in Los Gatos. This arrangement ended in 2005 when Fisher became too large to accommodate the Lakeside students and they were moved to Rolling Hills Middle School in Los Gatos. The high-school-aged students of the district still attend Los Gatos High School, but they can attend Saratoga High School if they so wish. 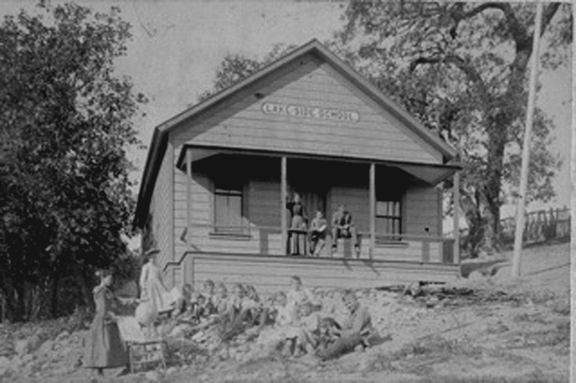 The little red school house continues to be used by the Los Gatos-Saratoga Observation Nursery School, a program of the Los Gatos-Saratoga Community Recreation Department, with the portable classroom in front of it being used for after school care for the Lakeside School students. This year, 2007, markes the 125th anniversary of Lakeside School, with a large celebration planned for May 5, 2007 from 11am to 4pm at the school. In addition, Lakeside School graduate, Karen Fishback, wrote a book about Lakeside School. Fishback’s father attended the school, as did her own children. Two of Fishback’s great aunts served as Lakeside School teachers and her grandmother, father, and Fishback herself all served on the Board of Trustees at one time or another. Thanks to Karen Fishback for her assistance in writing portions of this article. Thanks to William A. Wolf, Los Gatos Historian for providing valuable information about the history of the Santa Cruz Highway (Highway 17). Thanks to Santa Clara County Board of Supervisor’s Road File No. 126, “The Santa Cruz Gap Turnpike Joint Stock Company”, November 16, 1857 to November 16, 1877.